Want your kids to learn more about Irish heritage? Want them to have a blast this summer? Then, we know just the thing! 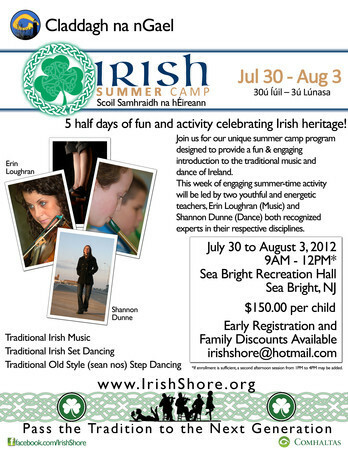 Irish Shore has teamed with the borough of Sea Bright to bring you the second annual Irish Summer Camp in Sea Bright Recreation Center this summer. 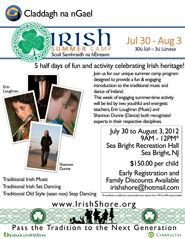 Kids will enjoy a variety of great activities that will also help them learn about the Irish heritage. The camp is help for a half day from 9 a .m. until noon Monday through Friday. This summer’s session begins on July 30th and runs until that Friday, August 3rd. It should be a great week for the kids, and parents are encouraged to sign up now as the start is just around the corner! The camp is being hosted by Sean Nos dancer Shannon Dunne and all-Ireland champion musician and NY Rose of Tralee winner Erin Loughran. Who better to have some fun with the kids and teach them about the Irish heritage? Unfortunately, the early registration discount has passed, but the fee is reasonable at only $150 per child for the week! You can also get a discount of $25 off when you sign up with a sibling or friend! Sea Bright residents can also receive 50% off the total fee! Parents – take some time for yourself and let the kids have a blast at Irish Summer Camp! At night, bring them in to Molly Maguire’s Black Point Inn in Rumson for some great Irish food and have a pint for yourself! Thursdays are Irish Night and kids eat free! “Like” Molly Maguire’s on Facebook for more great information, events, photos and specials!